About a year ago Greg Smith (of the appropriately named blog Quantified Rowing) and I were exchanging email about getting the famous Dan Burpee spreadsheet adapted for On The Water (OTW) rowing. We did it. I made a version for the Garmin Forerunner. Greg had a version for the SpeedCoach. Then I adapted it for the CrewNerd software. By fall we were exchanging emails about how great it would be to process the data using the fabulous Python NumPy numerical data analysis modules, and plot in Python’s free plotting libraries. I proclaimed that it would be great, but would require a lot of time and effort. We proceeded to chat about the need for a standardized data format for erg and OTW rows, so all data could be smoothly analyzed. Until[9one day, I discovered Painsled (desktop edition), and fell in love with it. It is a great software to gather all the data that the PM3/4/5 spits out. No other software captures so many data (drive length, drive time, everything). So I adapted my spreadsheet again. Then, on a good day in March 2016. Greg sent me a plotting routine written in Python, which works with the Painsled iOS data format. It took me two days to have a TCX version working which I could use with CrewNerd. I then proceeded to add ErgData, Painsled Desktop and RowPro parsers and threw the Python code on https://pypi.python.org/pypi/rowingdata for the community to use it. But of course this was cumbersome for anyone except Greg and me. You had to install Python, then the data, and use awkward command line tools. So Greg and I started thinking about a graphical user interface.9It was my idea to do a web interface, and I quickly had something “working”. The page disconnected for any row longer than 20 minutes. A few weeks later I had something reasonable, and I wrote about it on the Concept2 and Free Spirits Fora. That’s when most of you guys joined. The joy of having a team of testers. Emails started coming in about glitches. Broken image links. I remember Mike was trying out things while I was updating the software at the same time. I think that with interactive plots of acceptable quality (I know they can be improved, but Mike I did a hoover function specially for you, and I can give you crosshairs if you want),[9and more importantly with today’s BIG NEWS of being approved to upload to and import from the C2 logbook we have reached a big milestone. 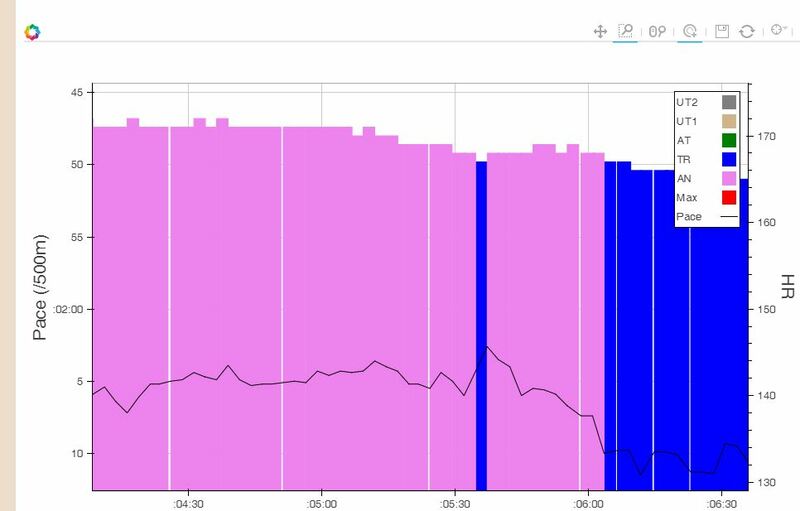 I know there are glitches (ErgData Interval workout, the workout duration and total meters, and more). But it’s a nice place to be, finally. It starts to look like something that could be of use, somehow, to a few people. I have some rowing physics lying around and I want to integrate that so we can do, for example, comparisons between OTE and OTW workouts in terms of power and pace. I want to implement some new cool plots. Perhaps expand some of the interactive plotting. Export to Strava is missing. And to other fitness tools. This evening I was looking at a mirror flat lake, when a phone call came from one of our Masters 8+. He was in a traffic jam and wouldn’t make it in time. It was the first time I have not regretted that an OTW row in perfect conditions was canceled. 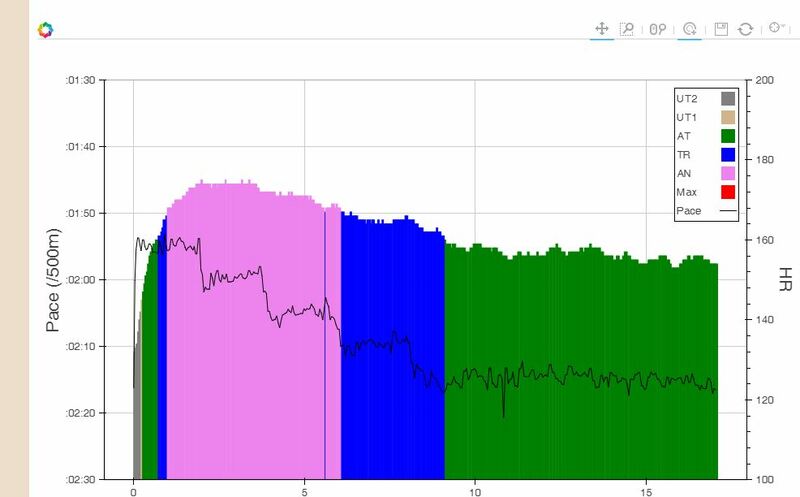 I was looking forward to rowing on the erg, in my basement, using the ErgData app, to test the ErgData ==> C2 ==> Rowsandall workflow. Thanks guys for hanging on here with all the bugs and glitches. Thanks for the time you spent on this chat. I think we should stay in beta for a couple more months, to get everything ironed out nicely. But the hard work is done. 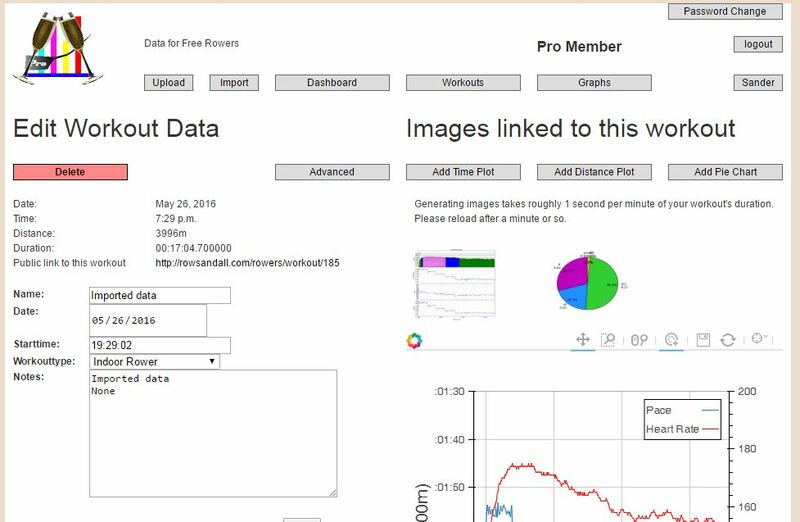 The workout edit page with the plots I made and a small interactive plot. This is the 4km cooling down. A big interactive plot of the same cooling down. Unfortunately the server keeps crashing tonight. I will need to call the helpdesk tomorrow.